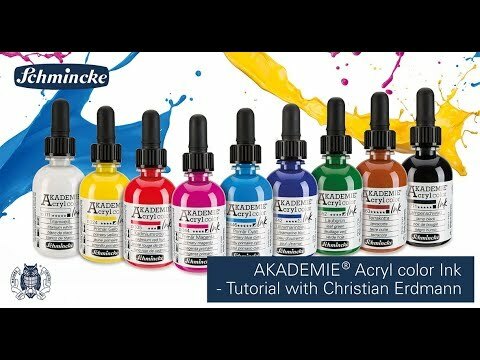 Schmincke's AKADEMIE® Acryl color suits the needs of not only the ambitious beginner but also the demanding professional artist. The 60 brilliant, intense and extremely lightfast colours form a sophisticated assortment that includes three shades of white and special effect colours (including gold, silver and neon colours). All the colours are created without cadmium pigments. Further advantages of this range are the completely waterproof drying, the long open time of the colours and a pleasant odour. Just as with all other acrylic colours, AKADEMIE® Acryl color can be mixed and combined with any other Schmincke colours (PRIMAcryl®,College® Acrylic and AERO COLOR® Professional) and all acrylic mediums. Stretched frames, painting boards, acrylic paper, wood and other clean, grease-free surfaces are suitable as painting surfaces. 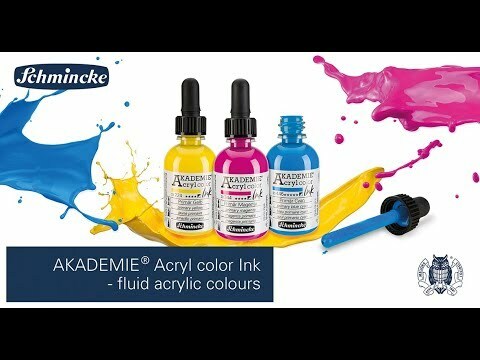 AKADEMIE® Acryl color is now also available in a liquid form, as "pigmented acrylic ink" for painting and writing with our liners No. 2-6 (except gold and silver). Lunar galaxie with AKADEMIE® Acryl color Ink Christin Stapff "MÄDCHENKUNST"
PRIMAcryl® und AERO COLOR® Professional: Aus alt mach neu!